V0600. 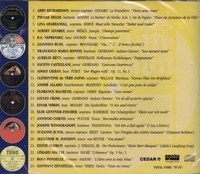 VOCAL RECORD COLLECTORS' SOCIETY - 1999 Issue, incl. Abby Richardson, Pierre Deldi, Lina Abarbanell, Antonio Cortis (Unpublished Victor Test Pressing), Albert Alvarez, B. S. Veprinsky, Giannina Russ, Gérard Souzay (Live Performance, 29 Nov., 1948), Francesco Maria Bonini, Fausto Castellani, Rosa Ponselle (Unpublished, 16 Oct., 1952, Villa Pace), Aurelie Révy, Adolf Lieban, André Allard, Clémentine de Vère-Sapio, Florence Macbeth, Giulio Crimi, Else Gentner-Fischer, Joseph Winogradoff, Suzanne Juyol, Alexandr M. Davidov, Einar Nørby, Edith Oldrup & Giovanni Zenatello (Zenatello’s last known recording, preceded by his brief speech, 1948 Broadcast). VRCS 1999. Transfers by Seth B. Winner.